Would you look at all that awesomeness? That’s a whole lot of gluten-free goodness staring at you, right there. And, all of these fine products are from the Katz Gluten Free Bakery. Katz is hosting an end of summer celebration, and offering gluten-free bloggers the chance to sample their products, post a review and host a giveaway. I am super excited to be doing this, because the Katz products are some of the tastiest gluten-free, dairy-free baked goods I’ve experienced on the market. So, what’s in the picture up there? After taking this picture I invited all the neighborhood kids (5 of them ranging in age from four to eight) and a few grown-ups to come on in and sample the goods. Oh boy, were those kids (and grown-ups) happy campers. Now, you don’t get the most articulate of feedback from this age group. Mostly it was “yum!” and “this is good!,” and “I like this one best.” So, we’ll rely on the grown-ups for a little more detail. The chocolate strip was the favorite of one grown up. She said it’s sweet and moist, without being too sweet. You can’t help but compare it to the chocolate rugelach, which is a bit dryer and crispier. She preferred the softer texture of the strip. My kiddo (who is used to these taste testings now) said, “it tastes more cinnamony than chocolately to me.” There is a definite cinnamon hit, but the chocolate asserts itself as well. Everyone gave this one 2 thumbs up. The marble cake didn’t have quite the “wow” factor and no one picked it as their favorite. But, everyone said it was moist and good and “tastes like cake” – which is saying a lot when you’re dealing with gluten-free baked goods and a bunch of gluten eaters. The chocolate cupcake pleased all the kids in the crowd. It was the favorite of one kid, and the rest thought it tasted exactly like a cupcake should. (Secretly, I think they were disappointed that it wasn’t frosted, but that’s kids for ya.) Again, it wasn’t my favorite, but there were no off tastes, no funky texture, the right amount of sweetness, and a pleasant amount of moistness. If you’ve been looking for a substitute for Chips Ahoy, look no further than these chocolate chip cookies. They have that same light crispness, that same sweet saltiness that Chips Ahoy have. Well, at least how I remember them being. It’s been a while. This was the first item sampled and it set the tone – no one was afraid to try the rest after trying this one, gluten-free or not. The raspberry tarts were the hands-down favorite in the crowd. Three of my tasters picked it as tops. Of course, my kid wouldn’t even try it. (“I don’t LIKE raspberry, Mom.”) He had previously tried the apricot tarts, though, and these are essentially the same except for the topping. (He loved the apricot version.) Think of a light, crisp shortbread crust with a dab of delicious preserves and you’ve pretty much got it. Finally, the chocolate rugelach – my personal favorite. I love rugelach. I had previously had the cinnamon variety and completely fell in love. I think I still prefer the cinnamon, but the chocolate is a close second. The pastry is crispy and light. There are actual flakes in that there pastry! So delicious. Now, you might have noticed that none of these products are vegan. They all contain eggs. And, certainly none are grain-free. So, I won’t be making a habit of eating any of these items on a regular basis. But, knowing that they’re out there and available as a treat when I want one sure is good. And on days like today – when it’s 85° and 90% humidity and I’m supposed to be baking for the first day of school get together, I sure am pleased to be able to fall back on taking these baked goods instead. Wouldn’t YOU like to try some of these delicious treats, too? Well, you can, if you’re the lucky winner! Actually, for this giveaway, we’ll have 2 lucky winners. The grand prize is $25 Katz Dollars to spend as you see fit, and a free sample pack will go to the runner up. The contest will run until Saturday, September 11th. Good luck! Visit the Katz website and leave a comment below telling me something you’d like to try. Become a friend of Katz on Facebook. Follow my blog via an RSS reader. But wait! There’s still one more chance to win Katz goodies. You can enter their Summer of Desserts promotion on their website. Don’t forget to tell them that The Mommy Bowl sent you. You could win $100 of Katz goodies! Hurry – this contest runs through September 13th (National Celiac Awareness Day). The legal mumbo jumbo: While Katz did provide free product for this review, I was in no way obligated to provide a positive review in exchange for said product. This blog post is linked up with Gluten Free Wednesdays at the Gluten Free Homemaker. And Wholesome Whole Foods #15 over at Health Food Lover. This entry was posted in Contests, Product Review. Bookmark the permalink. WOW!! You know, working at Katz Gluten Free is hard enough, but when I see a picture like that, I just need to have some more rugelach! Thanks so much for the great review, and good luck to your readers!! Wow, everything looks so good. 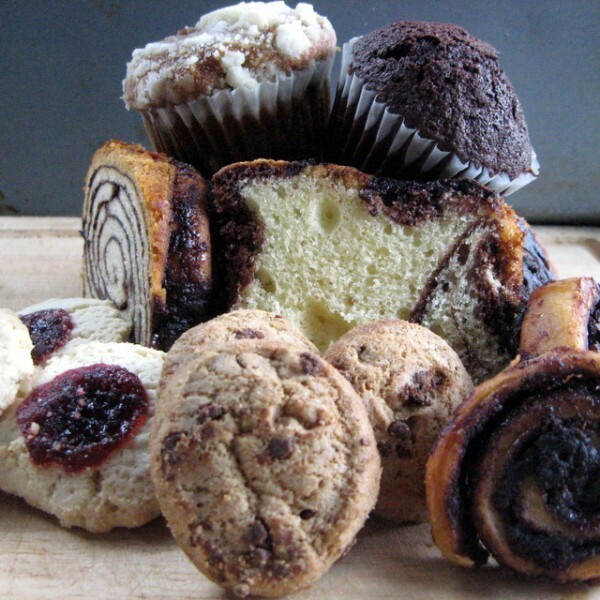 The rugelach is intriguing, and I’d love to try their challah. …and I subscribe to you through Google Reader! Chocolate strip-Gluten Free cake would be what I would enjoy trying!!YUM!!! Those Vanilla cup cakes look good to me! I have never had rugelech, but the cinnamon one is calling to me. Thanks for the review and giveaway. the honey muffins look awesome! I miss challah so much! I would love to try some gluten free. 1. I became a “friend” on facebook. The raspberry tart looks delicious. I’d love to try the gluten free challah! I’d love to try the Pizza Crust!! Ooh, those raspberry tarts sound amazing!